no photo of the Tipay, it was consumed before the cam could click! Ocho Grill is a culinary mecca for the whole island of Leyte. 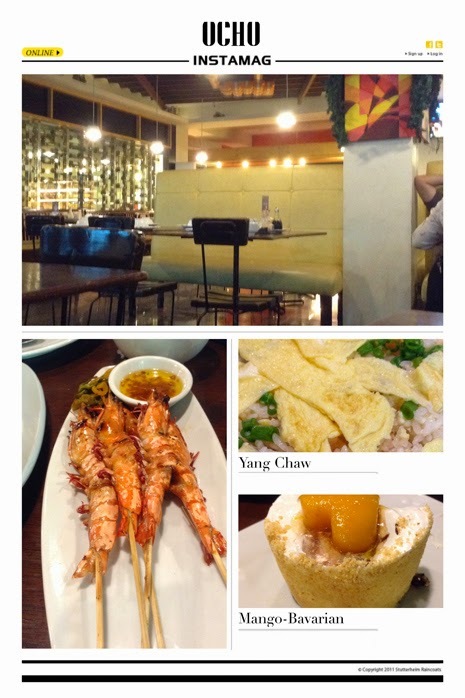 When this resto emerged years ago, it was an instant hit and if you've ever been, you would know why. The concept of "Sutokil" which is short for sugba-tola-kinilaw, translated in English: grill, soup and raw, marinated in vinegar (alá ceviche) was solidified in our city by this restaurant. All manner of seafood, meats and vegetables are arrayed in their raw form while the patrons would hand over the items to be prepared to their liking either grilled, as a soup/broth, ceviche-style or even deep fried, et violá, your food will be served to be enjoyed at your table. I visited this eatery a few times before and I will say, it has only gotten better. 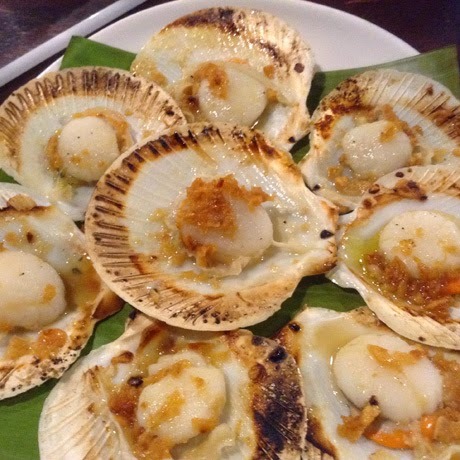 It seems that they have perfected how to grill the scallops (Tipay) which is garnished with garlic and butter and wherein all these elements are cooked while in the scallop shell making the shell it's own cooking ware. Mind you though, Ocho didn't pioneer this technique of grilling scallops but they have elevated it into a work of culinary art. Try all the items if you are able, one visit at a time because of a truth, I haven't found anything that I didn't approve of yet, that includes the Grilled Panga (Grilled Tuna cheek) and the calamari. From the prawns, large sea bass, pompanos, mullets, tuna, to the pork belly, beef shanks, chicken cuts and so on and so on, all combinations and possibilities are delectable. And here lately, they have added gratifying assorted cakes and what a plus it is. Ocho is quite a good food staple in Tacloban and the clientele ranges from Juan dela Cruz the average to the Juan dela Cruz at the other side of the spectrum. People from all walks of life and even clientele from all over world have graced Ocho, as it's a default place for Leyteños or Samareños to take foreigners to if they want to eat worthy Filipino food. Prices: from 120's - 300's and even higher. It maybe pricey for lowly folks like me but it's good if one wants to splurge on a birthday or anniversary and such. the succeeding venture of Ocho brought about the Tipay visual I originally wanted to share!